Microsoft Delve is an incredibly useful component of Office 365. Delve leverages "signals" to automatically surface information that may be relevant to a user. Signals include who you are related to in the organization and what content is shared, emailed, viewed, and/or modified by you or those around you. Signals are modeled inside of the Office Graph, which is the set of relationships that underpin Delve's intelligence and recommendations. Delve flips content search on its head. Instead of requiring a user to go look for content, Delve presents content to the user that it thinks is relevant based on the behavior (signals) of the user and the behavior (signals) of those around him/her. Let's look at a brief example. Imagine ACME Corp has an engineering department made up of Jane, Joe, Mike, Suzy, and Sarah. Delve would see that all five people report up to Jerome. On Monday, Joe shares a Power Point presentation with Suzy. That afternoon, Suzy modifies the presentation and the next day shows this presentation in a meeting with Jerome. These actions would be signals to Delve that would probably result in the Power Point presentation being surfaced on Jane, Mike, and Sarah's own Delve pages. The signals around this piece of content (and the signals of the relationships between the groups) indicate that it is a piece of content of interest. Signals drive everything for Delve; but, is Delve considering all the right signals to provide the best content suggestions to users? For all the good it does, Delve is omitting an extremely important signal from its model. The missing signal is the topic of the content, or what the content is about. Delve ignores this entirely. This is something that could be resolved with the SharePoint Managed Metadata Service and Term Store. The core benefit of the Term Store is to allow an organization to define a common language, or taxonomy, that it can use to tag content with metadata. A common language ensures that everybody is using the same terminology to reflect a concept. As a basic example, a company should decide if it wants to refer to Human Resources as "Human Resources" or "HR", Then all content tagged to the idea of Human Resources would have a consistent label. Without a consistent defined set of terminology, a user might search for "HR" but miss all the information that is tagged as "Human Resources". In the example above, content is surfaced among a team based on team members interacting with the content. However, what if people aren't on the same team? What if Michelle works in a different state or at ACME Corp? Currently, it's not clear that Delve would surface any information to her from the team above. Now let's look at the example where taxonomy and Managed Metadata are considered as signals by Delve. Michelle has an interest and expertise in "Stress Testing" and she tags her profile accordingly with "Stress Testing", which is a term in the ACME Corp taxonomy in its Term Store. The presentation that the engineering team is looking at is also tagged with "Stress Testing". If these Managed Metadata tags were in the Office Graph, these would be strong signals to Delve that the Power Point presentation the engineering team is working on would be really interesting to Michelle too. Figure 1: Delve already allows users to access the term store to fill out fields in the User Profile. The values just aren't considered in the Office Graph. People who don't work together directly should be connected to each other by these taxonomy driven topics of interest. The topic of a piece of content could allow Delve to surface interesting information to people across silos and facilitate true information sharing everywhere. Topics are great signals! All the components are in place. The SharePoint Term Store is a powerful repository for creating and managing enterprise taxonomies. As shown in Figure 1 above, Delve User Profiles can already be filled out using terms from the term store. The next step is to add these terms explicitly as nodes to the Office Graph so that Delve can use these signals to connect content to users based on what that content is about. Simply put, topic is an important signal, but it is a signal Delve is not currently receiving. This should be remedied. 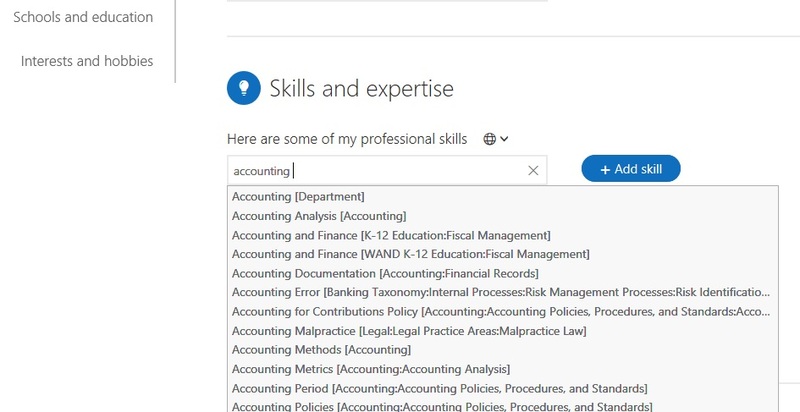 Here are my five recommendations for new taxonomy based features within Delve. 1) Add metadata tags as a signal for the Office Graph and Delve. This should be configurable at the Term Set level in the term store so that organizations can control which term sets/taxonomies should be considered as signals (nodes in the Office Graph). 2) User Profiles in Delve have fields for Projects, Skills, Expertise, Interests and Schools. These fields can be populated, not only with free text tags, but also by Managed Metadata terms inside the term store. Allow these fields to be associated to specific term sets so "Accounting Methods" won't be an option for the Schools and Universities field. Then, use the information as signals to surface Delve content. 3) More clearly expose the Managed Metadata tags that are applied to items on the Delve content cards. Tags should be emphasized so that users are encouraged to add them to content. 4) Managed Metadata tags are currently searchable, but in the Delve search interface it is not obvious that the hit is based on a managed metadata tag. This should be highlighted, not hidden! Enable managed metadata tags to be filterable with the Delve search interface. This will further drive the value of using metadata. Have "Topics" as a left hand filter option next to "Boards" and "People" on the Delve home screen. 5) Use taxonomy based topics to create dynamic Delve Boards with content that is tagged with the same term(s) and has been interacted with by users who share that interest. Delve Board titles, which effectively are tags, should be managed metadata - not just free form tags. Adding Managed Metadata and taxonomy support to the Office Graph would be a tremendous enhancement and enable intelligence based on the "aboutness" of content and based on the topics for which people have expertise. The pieces are all in place - Microsoft just needs to connect a few of the dots together to unleash significant new value. If signals are important, don't ignore the most valuable ones. If you agree with this article, let Microsoft know! Vote for this idea on the Office 365 user voice form and make your voice heard that you would like better Managed Metadata support in Delve.